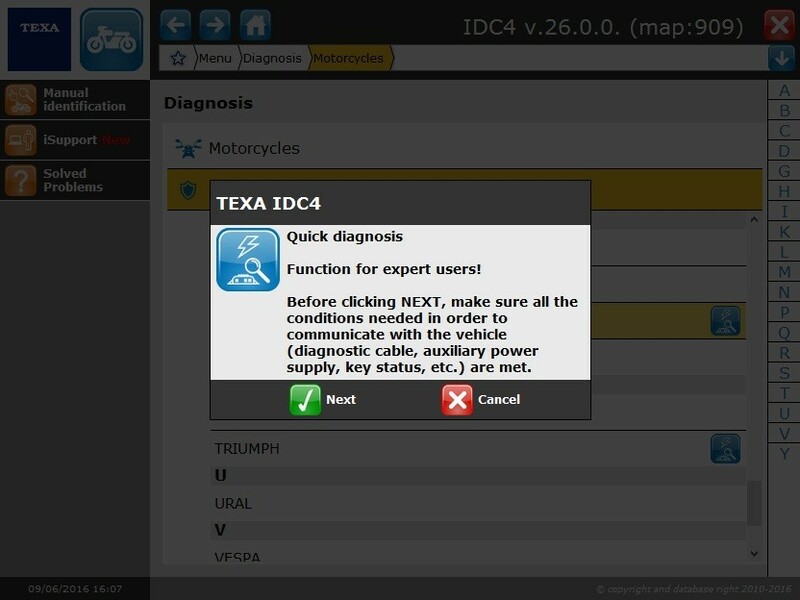 The new IDC4E BIKE V26.0.0 update includes the best of TEXA’s multi-brand diagnostic capabilities, with the support of technical data and additional functions. It is a concentration of new features and improvements concerning the diagnostic systems of the main manufacturers worldwide of motorcycles, scooters, snow mobiles, quads, minicars and personal watercraft. Below is a brief overview of the developments introduced in version 26 which now covers a range of 75 makes and over 2300 models. This update includes three new manufactures BAJAJ, BENELLI (DSK), KELLER and a series of important developments for DUCATI. The new model “Caponord 1200“ has been included with the related diagnosis of the ABS and petrol injection systems. New manufacture. The new models “Ninja 300” and “Ninja 650R” have been included with the related petrol injection system diagnosis. The new model “BN 251“ has been included with the related complete diagnosis and the ECU Update function (injection control reprogramming). New manufacture. The models “TNT 300”, “TNT 600 GT” and “TNT 600i” have been included with the related petrol injection system diagnosis. The models “TNT 899” and “TNT R” have been included with the related petrol injection system diagnosis and the service maintenance function (service reset). The new models “1299 Panigale”, “Panigale R” and “Scrambler 800” have been included with the related complete diagnosis, Global Scan, special functions and the service maintenance function (service reset). The complete diagnosis, Global Scan, special functions and service maintenance function (service reset) have been included for the models “Multistrada 1200”, “Multistrada 1200 D-Air”, “Multistrada 1200 Pikes Peak” and “Multistrada 1200 S/T”, production year 2015. Specific models for the Brazilian market have been included: “Multistrada 1200 (BRAZIL)”, “Multistrada 1200 Pikes Peak (BRAZIL)” and “Multistrada 1200 S/T (BRAZIL)”. The complete diagnosis, Global Scan, special functions and service maintenance function (service reset) are available. The Global Scan function has been included on all the vehicles that have more than one control unit. New manufacture.The model “K65” has been included with the related petrol injection system diagnosis. The manual service and maintenance function (service reset) has been included for the models “125 Duke”, “200 Duke”, “390 Duke”, “RC 125”, “RC 200” and ”RC 390”. The new models “Brutale 800 Dragster M.Y. 2016”, “F3 675 M.Y. 2016”, “F3 800 M.Y. 2016”, “Rivale 800 M.Y. 2016” and “Stradale 800 M.Y. 2016” have been included with the related complete diagnosis, ECU Update (injection control unit reprogramming) and service maintenance (service reset) functions. The new models “Turismo Veloce 800 Base M.Y. 2016” and “Turismo Veloce 800 Lusso M.Y. 2016” have been included with the related complete diagnosis, ECU Update (injection control unit reprogramming) and service maintenance (service reset) functions. The ignition system diagnosis has been included for the model “Liberty” produced from 2013. The new models “Tiger XR” and “Tiger XRx” have been included with the related complete diagnosis, Global Scan, special functions and service maintenance function (service reset). The new model “Vespa Sprint” has been included for the Korean market with the related ignition system diagnosis. 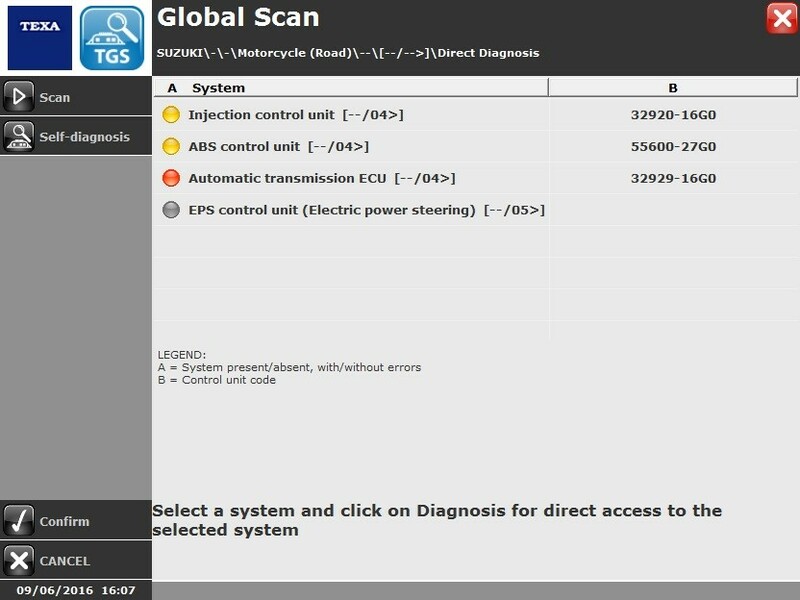 The Global Scan function has been included for the models “FJR 1300A”, “FJR 1300AS”, “XT 1200 Z Super Tenerè” and “YZF-R1”. The speed control system diagnosis of the models “FJR 1300A”, “FJR 1300AS” and “XT 1200 Z Super Tenerè” has been included. The automatic transmission system diagnosis of the model “FJR 1300AS” has been included. In addition to new diagnostic coverage TEXA also offer additional technical information such as data sheets, nominal value sheets, bulletins and wiring diagrams that are updated and extended with each software update. Within the IDC4E software, you can view all these new features in the DOCUMENTATION menu. There, you will find details of all the makes, models, systems and related diagnostic functions introduced in this version. AP35/OBD: Terminal cable compatible with all HARLEY DAVIDSON vehicles equipped with a 6-way socket (to be used with the cable 3151/AP05). In the price list it will replace the diagnostic cable 3151/AP35. 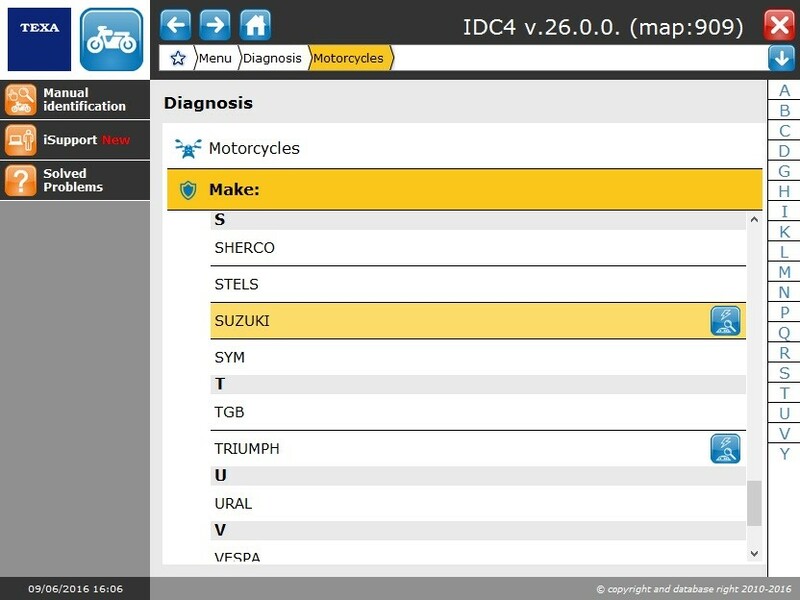 A completely new feature the in the IDC4E software: this new function allows you to access the diagnosis quickly by reducing the number of clicks guaranteeing a correct vehicle diagnosis. This way the usual passages needed to diagnose a vehicle, that require the selection of the make, model, engine code, period and finally the system, are no longer needed. Simply click on the button related to the function, located near the make, and connect the diagnostic tool to the vehicle. Based on the vehicle, on its equipment and on the diagnostic cable used, the software will access the injection system directly or it will carry out a scan indicating the systems that are available, with the option of a specific diagnosis. The function is available for the makes listed below however we recommend its use by experienced users only, as extensive knowledge regarding the vehicles being analysed and the use of diagnostic instrumentation is required. The quick diagnosis may not detect particular systems that require a different diagnostic cable rather than the one used for the rest of the equipment. 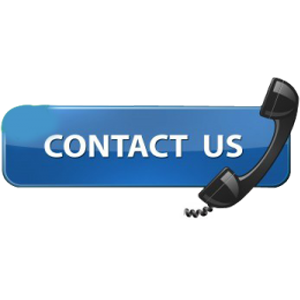 In these specific cases, we recommend the classic diagnosis, selecting the system manually. Bike category: HONDA, KAWASAKI, SUZUKI, TRIUMPH. Quad category: ARCTIC CAT, CAN-AM (BRP), KAWASAKI, SUZUKI. Snow mobile category: ARCTIC CAT, LYNX (BRP), SKI-DOO (BRP).